Nov 03, 1998 in "Main Street Electrical Parade"
Street lights faded along Main Street, U.S.A., at Disneyland in Anaheim, California, leaving the curbside audience in dark anticipation. Then an electronically created voice magically cut the night in a sing-song chant: "Ladies and gentlemen, boys and girls, Disneyland proudly presents our spectacular festival pageant of nighttime magic and imagination in thousands of sparkling lights and electrosynthomagnetic musical sounds…the ‘Main Street Electrical Parade!’"
The original Main Street Electrical Parade from Disneyland now is getting stage-ready for a different Main Street U.S.A. – at Walt Disney World Resort. After almost 3,6000 West Coast performances before 75 million guests, a makeover of 575,000 glittering new lights and a 2,400-mile transcontinental journey, this sparkling "crown jewel of summer" in Southern California from 1972 to 1996 will be presented in the Magic Kingdom beginning May 28. It’s part of the most explosive year of entertainment growth in Walt Disney World history, with 12 new attractions, spectaculars, shows and adventures plus a brand new family resort all part of the Disney "funscape" in summer 1999. 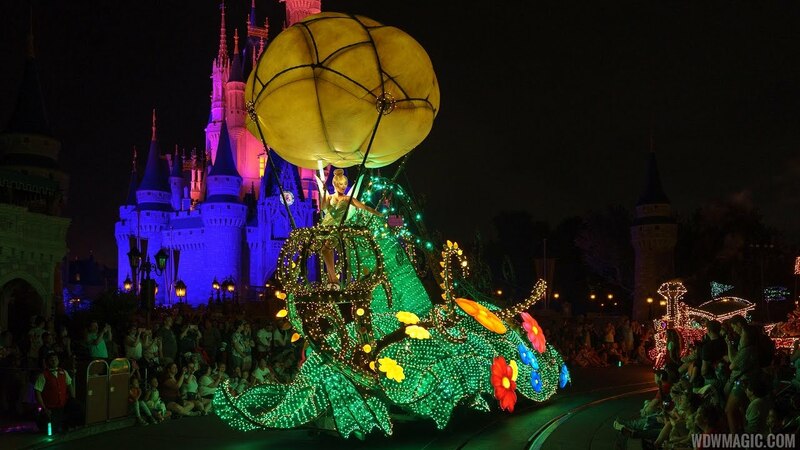 The original Main Street Electrical Parade, a beloved procession of Disney stories brought to life in shimmering colored lights and bouncy, bubbly music, ends a three-year hiatus with its engagement at Walt Disney World Resort. A May 5 ceremonial arrival on highways near the Magic Kingdom will give a glimpse of the spectacle in store. 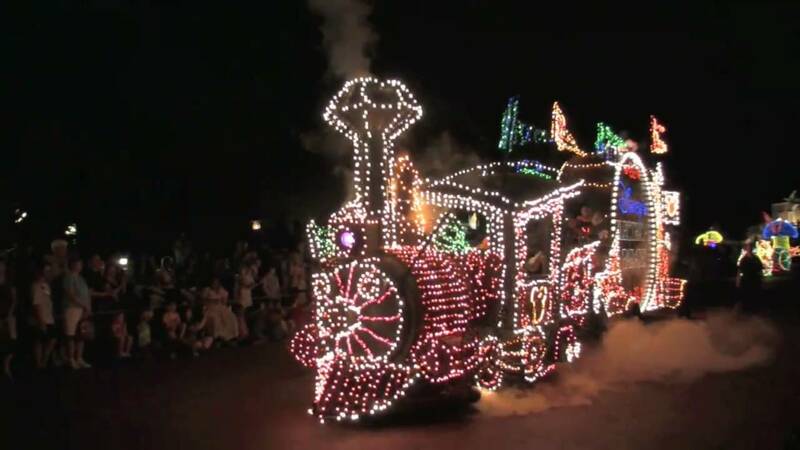 Longtime fans may recall a version of the Main Street Electrical parade that was crafted for the Magic Kingdom in 1977…and which bid farewell after 15 seasons to begin an engagement at Disneyland Paris. Fans of that parade will recognize some of the units of the original Disneyland Main Street Electrical parade, including the Blue Fairy from Pinocchio as the "grand marshal" aglitter in a winged gown of more than 10,000 blue, amber and crystal lights. A cadre of Disney characters in costumes lined with lights joins the procession following the huge, 122-foot-long, 80,000-light patriotic finale. In preparation for the Walt Disney World debut, units have all been dressed up in more shimmering fabrics to add new sparkle to the multi-color light show. An enhanced sound system will provide 30% more audio presence for the bouncy musical score performed on synthesizer. The main musical theme used throughout the parade was adapted from a synthesizer piece known as "Baroque Hoedown," written in 1967 by Gershon Kingsley and Jean-Jaques Perrey. It was discovered by Disney entertainment creators, who produced a recording of the main tune interwoven with Disney themes suitable for the various parade segments. A troupe of more than 100 parade entertainers, technicians and other support personnel – plus batteries capable of enough amperage to light up a street of 32 homes – brings the parade to life for each performance. The fanfare music and Blue Fairy herald a 20-minute spectacle of parade segments based on Disney themes – Alice in Wonderland, Cinderella, Peter Pan, Dumbo, Snow White and Pete’s Dragon. The "signature" unit for the parade, the Casey Junior Circus Train (from Dumbo), has Goofy at the controls of the engine, pulling a huge bass drum that announces in lights, "Magic Kingdom Presents The ‘Main Street Electrical Parade.’" The memorable float finale honors America with a flowing red and white field of lights, "fireworks" and a golden eagle. With the arrival of the Main Street Electrical Parade, at Walt Disney World Resort, another spectacle of nighttime lights and music, SpectroMagic, will go on hiatus. It has been enchanting Magic Kingdom guests since 1992.